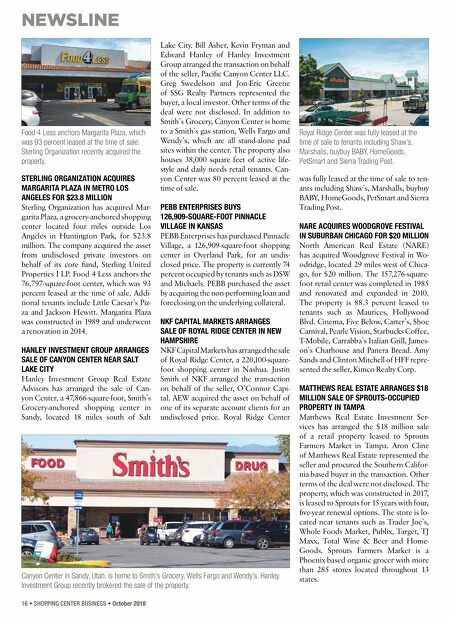 16 • SHOPPING CENTER BUSINESS • October 2018 NEWSLINE STERLING ORGANIZATION ACQUIRES MARGARITA PLAZA IN METRO LOS ANGELES FOR $23.8 MILLION Sterling Organization has acquired Mar- garita Plaza, a grocery-anchored shopping center located four miles outside Los Angeles in Huntington Park, for $23.8 million. The company acquired the asset from undisclosed private investors on behalf of its core fund, Sterling United Properties I LP. Food 4 Less anchors the 76,797-square-foot center, which was 93 percent leased at the time of sale. Addi- tional tenants include Little Caesar's Piz- za and Jackson Hewitt. Margarita Plaza was constructed in 1989 and underwent a renovation in 2014. HANLEY INVESTMENT GROUP ARRANGES SALE OF CANYON CENTER NEAR SALT LAKE CITY Hanley Investment Group Real Estate Advisors has arranged the sale of Can- yon Center, a 47,866-square-foot, Smith's Grocery-anchored shopping center in Sandy, located 18 miles south of Salt Lake City. Bill Asher, Kevin Fryman and Edward Hanley of Hanley Investment Group arranged the transaction on behalf of the seller, Pacific Canyon Center LLC. Greg Swedelson and Jon-Eric Greene of SSG Realty Partners represented the buyer, a local investor. Other terms of the deal were not disclosed. In addition to Smith's Grocery, Canyon Center is home to a Smith's gas station, Wells Fargo and Wendy's, which are all stand-alone pad sites within the center. The property also houses 38,000 square feet of active life- style and daily needs retail tenants. Can- yon Center was 80 percent leased at the time of sale. PEBB ENTERPRISES BUYS 126,909-SQUARE-FOOT PINNACLE VILLAGE IN KANSAS PEBB Enterprises has purchased Pinnacle Village, a 126,909-square-foot shopping center in Overland Park, for an undis- closed price. The property is currently 74 percent occupied by tenants such as DSW and Michaels. PEBB purchased the asset by acquiring the non-performing loan and foreclosing on the underlying collateral. NKF CAPITAL MARKETS ARRANGES SALE OF ROYAL RIDGE CENTER IN NEW HAMPSHIRE NKF Capital Markets has arranged the sale of Royal Ridge Center, a 220,100-square- foot shopping center in Nashua. Justin Smith of NKF arranged the transaction on behalf of the seller, O'Connor Capi- tal. AEW acquired the asset on behalf of one of its separate account clients for an undisclosed price. Royal Ridge Center was fully leased at the time of sale to ten- ants including Shaw's, Marshalls, buybuy BABY, HomeGoods, PetSmart and Sierra Trading Post. NARE ACQUIRES WOODGROVE FESTIVAL IN SUBURBAN CHICAGO FOR $20 MILLION North American Real Estate (NARE) has acquired Woodgrove Festival in Wo- odridge, located 29 miles west of Chica- go, for $20 million. The 157,276-square- foot retail center was completed in 1985 and renovated and expanded in 2010. The property is 88.3 percent leased to tenants such as Maurices, Hollywood Blvd. 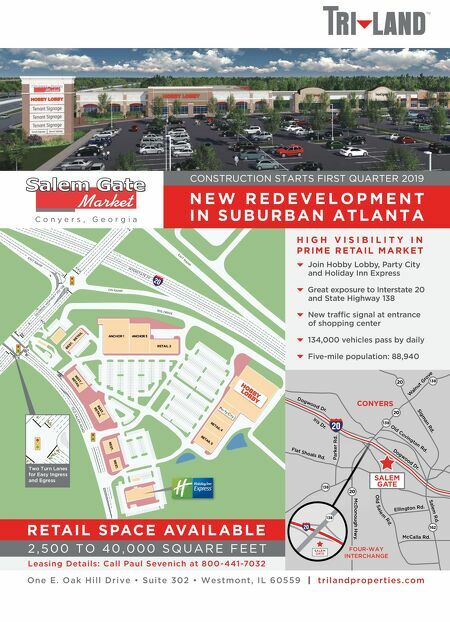 Cinema, Five Below, Carter's, Shoe Carnival, Pearle Vision, Starbucks Coffee, T-Mobile, Carrabba's Italian Grill, James- on's Charhouse and Panera Bread. Amy Sands and Clinton Mitchell of HFF repre- sented the seller, Kimco Realty Corp. MATTHEWS REAL ESTATE ARRANGES $18 MILLION SALE OF SPROUTS-OCCUPIED PROPERTY IN TAMPA Matthews Real Estate Investment Ser- vices has arranged the $18 million sale of a retail property leased to Sprouts Farmers Market in Tampa. Aron Cline of Matthews Real Estate represented the seller and procured the Southern Califor- nia-based buyer in the transaction. Other terms of the deal were not disclosed. The property, which was constructed in 2017, is leased to Sprouts for 15 years with four, five-year renewal options. The store is lo- cated near tenants such as Trader Joe's, Whole Foods Market, Publix, Target, TJ Maxx, Total Wine & Beer and Home- Goods. Sprouts Farmers Market is a Phoenix-based organic grocer with more than 285 stores located throughout 13 states. Royal Ridge Center was fully leased at the time of sale to tenants including Shaw's, Marshalls, buybuy BABY, HomeGoods, PetSmart and Sierra Trading Post. Canyon Center in Sandy, Utah, is home to Smith's Grocery, Wells Fargo and Wendy's. Hanley Investment Group recently brokered the sale of the property. Food 4 Less anchors Margarita Plaza, which was 93 percent leased at the time of sale. Sterling Organization recently acquired the property.